For those who want to make a fortune in the internet. I think the ebook I want to introduce here is a good start. 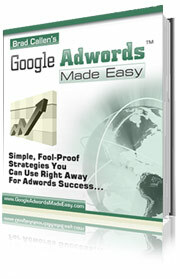 This ebook "Google Adwords Made Easy" is by Brad Callen. Brad Callen makes thousands of dollars every month via his internet bussiness. I hope to give you this ebook absolutely FREE! Hope you enjoy this ebook!